Aladdin Sharpener- USA made for 60 Years! 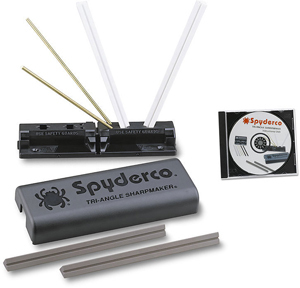 Made in the USA for decades, this tungsten carbide sharpener performs at a great price. Mounts easily anywhere you want. Just pull a knife through a few times to dress up the edge and you have a cutting tool. They are offered at a really low price. Smith and Wesson has produced various SWAT series through the years. They came out with the assisted openers recently. The medium size is fairly conventional and we have them offered at very low prices on special. The reason is that they have come up with a new design that utilizes a flipper on top of the handle and this opens these knives wickedly fast. The large and small models are phenomenal! Are they actually switchblades? Legally, no, as far as we can tell and we are going by Smith and Wesson’s legal guidelines. 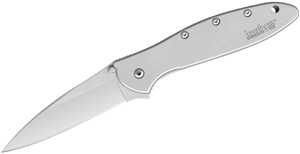 These are faster than just about any switchblade we have seen and the whole series sells for less than $40 each! They have a safety built into the handle and are made in Taiwan. The Benchmade Strykers have been around for many years and recently Benchmade has added the Nitrous super fast assisted opening system. These are the first Mini-Strykers with this feature. BM906SBKD2 has the tanto style blade and the BM907SBKD2 has a drop point blade. These are made in the USA from top quality material. The blades are D2 tool steel for excellent edge holding ability and the handles are textured G10 for great gripping ability in all conditions. The Junkyard Dog designed by Tim Galyean has been a favorite with many of our customers since its release. Kershaw has released a series of versions and this latest one is spectacular. The KS1725CB features their composite steel giving you the use of CMP-D2 very tough steel for the edge and a softer stainless steel for the rest of the blade for better corrosion resistance and to reduce the cost – plus a copper accent where the two steels come together! So, it works great, is not expensive and looks very cool. What’s not to like about this knife? Benchmade produces the CSK in the US. They have been some of the sturdiest large fixed blades we have sold and this new revised model is no different. It has thicker steel than the older model. 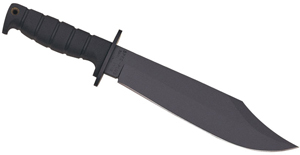 The CSK features a 6″ carbon steel blade and great feeling grip. The Kulgera is the latest in the Osborne designed Axis locks from Benchmade. It has a solid G10 handle with alternating layers of blue and black. The blade is S30V and the action is quick. When we saw these gorgeous knives, we immediately ordered them in. We are, after all, the Knife Center and we try to offer every possible knife to our customers. These are made by hand in Thailand and are a beautiful accent to an Hors D’Oeuvre or cheese tray. They also make a handsome gift and come in a fabric box. Each knife measures 4.75″.